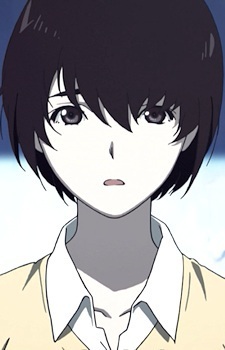 Lisa Mishima is a quiet and shy girl who attended the same high school that Nine and Twelve had transferred to. Because of her clumsiness and shyness, she was an easy target for the bullies in her class. As she came to know the two boys, Nine and Twelve, she felt a connection. Like they all had something in common and she had grown attached to them, especially Twelve. Nine didn't see her as very useful when she lived with them. Always in the way and always burning food, you can see why. But Twelve did not feel that way, for he had gotten too involved with her and was very affectionate toward her. Her father and mother are divorced, and her mother is over-protective and appears to be mentally unstable. She holds the fear that Lisa would also one day leave her just like Lisa's father did once.